Abe's Market: $25 for $50 worth of Natural Goods from Jungle Cents!!! Jungle Cents (a weekly deal site!) has a fantastic offer at Abe's Market! You can get $50 worth of natural goods for only $25! I ordered organic coffee recently from Abe's Market, and it was among the best I've ever had! They have all kinds of great natural goods! New to Jungle Cents? You can subscribe here to get the emails! 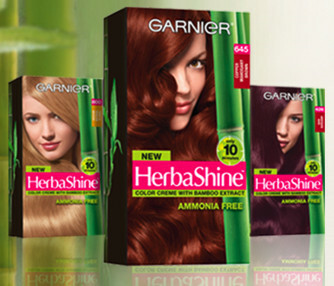 Freebie: Free Box of Herbashine Hair Color! Head on over here & fill out a short form for your FREE box of HeraShine Hair color! The coupon will come in the snail mail! Restaurant.com: 80% off Gift Certificates! Only $2 for a $25 . . . PLUS 30% cash back!!! I absolutely love Restaurant.com and I love them the most when they have these awesome sales!!! Right now you can get Restaurant.com Gift Certificates for 80% off!!! Just use code GOBBLE. You'll be able to grab a $25 gift certicate for only 2 bucks!!! But wait . . . it gets so much better!!! If you go through Shop At Home first, you'll get 30% cash back!!!! 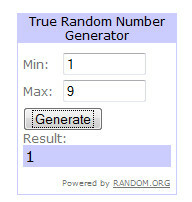 The lucky winner of the first ever Crunchy Deals Crazy Dog Tshirts giveaway is . . . . #1! Commenter #1 said, "i like the what would Mcgiver do? shirt"
There will soon be another Crunchy Deals giveaway! Be sure to enter so you can be the next big winner! 'Tis the season . . . my favorite season at Starbucks! Starting today through November 21, seasonal flavors of Starbucks beverages are BUY ONE GET ONE FREE from 2 to 5 PM! I'm thrilled about this one! 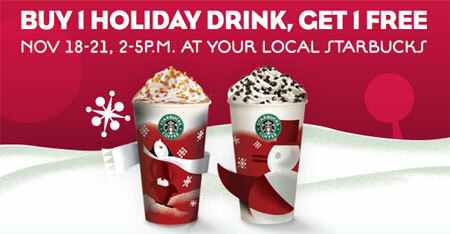 You can choose from Peppermint Mocha, Eggnog Latte, Gingerbread Latte, Caramel Brulee Latte & more! Also, be sure to text 12DAYS to the number 29943 for a special offer each day starting December 1st! I can't wait to find out what the offers are!!! COUPON: Eggs $ .55 off 2 dozen eggs -- ANY BRAND!!! There's an eggcellent coupon right now for $ .55 off (2) one-dozen eggs!!! The best part is it's for ANY brand!!! Hurry and print it if you want it! Groupon: $25 for $50 worth of clothing at American Apparel!!! Groupon has an AWESOME deal today on American Apparel! Get $50 worth of clothing for only $25. Go here to browse around. Lots & lots of cute stuff! The Company Store: Personalized Toiletry Bag only $9.44 + FREE SHIPPING + FREE MONOGRAM! I love The Company Store! And I love personalized presents! 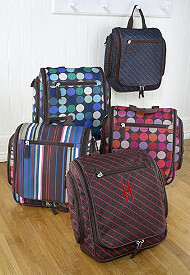 There is an awesome deal on these toiletry bags (and actually all their luggage collection) is 50% off! Regularly priced at $19, but it ends up being only $9.44!!! The price will come down when you place your item in your cart, and then enter the code 50OFFLG in the Promotion Code section. SHIPPING is FREE and MONOGRAMMING is FREE! There are a bunch of styles to choose from. Wouldn't it be great to fill it with a bunch of FREE toiletries you get from couponing for a nice gift?!? Plus, The Company Store has a fun giveaway right now where 5 lucky winners win your shopping bag! The Company Store will reimburse you for everything you purchase if you WIN! Awesome! Shop At Home is offering 3% cash back, so be sure to go through them first! 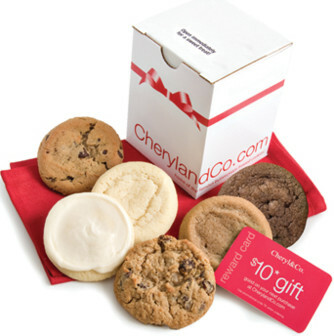 FREE COOKIES: Cheryl's (Cheryl & Co.) Free Cookies (Just pay shipping) + $10 Reward Card!!!! Instant Win Game: Philosophy Candy Cane Instant Win Game! 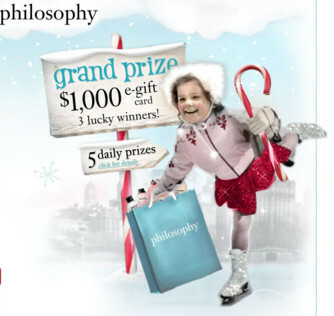 Play for your chance to win big prizes from Philosophy's Candy Cane Instant Win Game! 5 prizes are awarded daily and 3 lucky winners will win a $1,000 e-gift card! Play daily through Dec.23! Good luck & let us know if you're a winner! Giveaway: Last Day To Enter! There's Still Time To WIN!!!! Just a reminder to enter the very first ever Crunchy Deals GIVEAWAY!!! Mystery T-shirt or a $15 Gift Card for Crazy Dog T-Shirts! Read more about it & sign up here! Harris Teeter: NEW e-Vic Coupons are here!!! I just got this exciting email from Harris Teeter! They now have e-VIC coupons! They load directly onto your VIC card! You will have to create or update your profile. If you aren't already an e-VIC member, make sure to sign up here! You'll get personalized weekly emails, e-Vic only specials and more! ~~ Buy groceries and scan your VIC card at any Harris Teeter register. ~~ Save without having to clip, carry or remember paper coupons. A list of answers to the questions you may have are right here! As I find out more info about this new & exciting program, I will let you know! Please share if you have any info as well! Victoria's Secret: Sweater, Lip Gloss Set & Mystery Card: $19 + FREE SHIPPING! Victoria's Secret has an awesome deal right now! This cotton and cashmere three quarter sleeve shrug sweater is on sale from $38 to only $19! Add the sweater to your cart. Click Offer Code. This will take you to a screen where you can add up to 3 Offer Codes. Use code WARMSHIPVS to get FREE SHIPPING! Use code LIPGIFT10 to get a FREE Lip Gloss Set! & You will automatically get the Mystery Reward Card with your purchase! The FREE Mystery Reward Card will be worth at least $10! (maybe more if you're lucky!) You will be able to redeem this December 1 through the 19th. Make sure to go through Shop At Home for 2% cash back! 9 Pairs of Sunglasses: $10 SHIPPED from Graveyard Mall! I've read a bunch of good things about this deal at Graveyard Mall! Right now you can get 9 Pairs of Women's Sunglasses for only $9.99 with FREE SHIPPING! It's a random assortment of brand name sunglasses. These would make nice little gifts (maybe a teacher or a mail carrier? or a sister that loses sunglasses all the time?) or stocking stuffers. 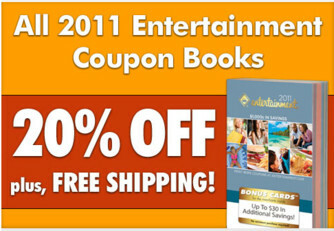 Entertainment Book: 20% off + FREE SHIPPING + 35% Cash Back (with Shop At Home!)!!! Entertainment Books are the perfect gift for those money-saving junkies in your life! There are coupons for everything from restaurants to local attractions! Each location has different coupons, so go here to check your local book out! I buy at least one book every year for myself, and it quickly pays for itself. I'm in the market for a few books to give as gifts this year, so I've been trying to scope out good prices! Right now Entertainment.com is offering 20% off plus FREE SHIPPING. My local book is on sale for $28 (down from $35). Additional books are $20! Shop At Home: 110% Cash Back Guarantee! I was so happy to learn the other night at the Shop At Home Twitter Party that Shop At Home has a new policy that is seriously going to change my online shopping for this upcoming holiday season as well as all the time! They are now offering a 110% Cash Back Guarantee!!!! "Nobody beats Shop At Home's Cash Back Offers, Nobody. 110% Guaranteed!" You know how some stores will honor coupons from competitors stores? Well, we do even better. From now on you can count on Shop At Home to have the best available cash back rewards on the Internet. Do your best to find anything better—and if you do, not only will we meet it, we will beat it. If you find another cash back site that is offering a cash back percentage that beats ours, let us know. We will offer to meet it at 110%! So for instance, if you find a cash back offer at another site for 10% back, let us know, and we will give you 11% cash back! That’s our 110% top cash back guarantee! Even if the site is running a limited-time double or triple the normal cash back for a store we offer cash back on, we will still be it by 110%, guaranteed. Read more details about the new policy right here! Make sure to sign up for Shop At Home if you aren't yet a member! It's free to sign up and you get a $5 credit after you make your first purchase (& for referring friends, too!)! Make sure to go through Shop At Home first. Search for the store that you are looking for . . . and voila! You will earn cash back! What do you think about this new policy? Will you be using Shop At Home exclusively? 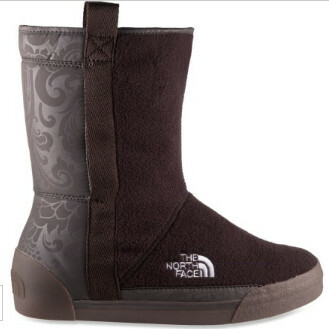 The North Face Boots $35 with free shipping to REI store! Hurry! REI is offering a really awesome deal on these The North Face Women's Mountain Booties. They are on sale from $75.00 to $49.93 . . . but once you add them to your cart the price will drop to only $34.93 with FREE SHIPPING to your REI store . . . otherwise pay $5.99 shipping! These are so adorable! If you want 'em act fast because sizes are running out quickly! Make sure to go through Shop At Home first for 4% cash back! Rite Aid: Huggies Diapers only $1.49 a Pack (Pure & Naturals, too!)!!! Rite Aid has a killer deal on Huggies diapers this week! Starting today, Sunday, through November 20th, you can grab a jumbo pack of diapers for as low as $1.49 a pack!!! 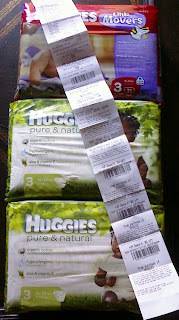 Here's what I did . . . .
Then I used 3 Huggies manufacturer coupons: 2-$2.50 off Huggies Pure & Naturals and one $2.50 off Huggies Little Movers coupons. This brought my total all the way down to only $13.47!!! But it gets sooo much better . . . then I got three $3 +Up Rewards back ($9 total!) . . . making each pack only $1.49 a pack!!! I know I say it a lot, but I really heart Rite Aid!